When you have an overabundance of root vegetables you’re not quite sure what to do with, make this soup. Roasting vegetables brings out their natural sweetness and combining them with garlic and salty broth adds a complexity of flavors to this comforting dish. Any number of root vegetables could be used, including sweet potatoes, squash, radishes, or parsnips. 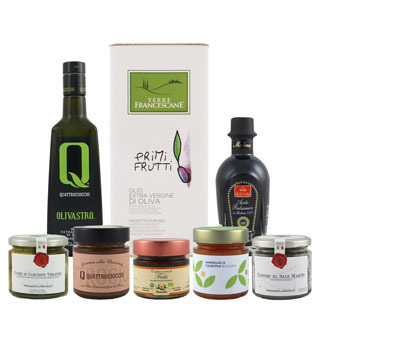 The Crete Gold PGI Chania olive oil has fruity hints of green apple and freshly cut grass, working simultaneously as a counterbalance to the root vegetables while pairing perfectly with the fresh parsley, cool mascarpone, and tart lemon atop the crunchy crostini. Note: It’s not necessary to peel the carrots, turnips or rutabaga, unless you prefer. Mascarpone cheese is usually found in the sour cream section of the dairy isle. Goat cheese or ricotta could be used instead. Preheat oven to 400°F. Cut vegetables into small, one inch chunks of equal size. In large bowl, toss approximately ¼ cup olive oil with rutabaga, celeriac, carrots, turnips and garlic. Do in batches if necessary and add more oil until vegetables are coated. Place casserole dishes in oven to roast for 45-60 minutes, until vegetables are browned on the edges and a bit shriveled, stirring and rotating the dishes once. While the vegetables are roasting, cut baguette into 1 inch thick slices. Place ¼ cup olive oil in a bowl and dip one side of each bread slice into the olive oil to cover. Place bread oil-side up on an unlined baking sheet and set aside. Chop onion into ½ inch pieces and place in a medium stockpot with 2 tbsp oil and sauté until translucent. Add vegetable broth and 2 cups water. Bring to a boil. Add the roasted vegetables, cover, turn temperature to low and cook for 10 minutes. Place bread in the oven for 6-10 minutes, until lightly browned on the top. Remove and set aside to cool. In a small food processor, make the crostini spread by chopping the 2 garlic cloves. Add the fresh parsley, lemon juice and mascarpone. Pulse until combined. 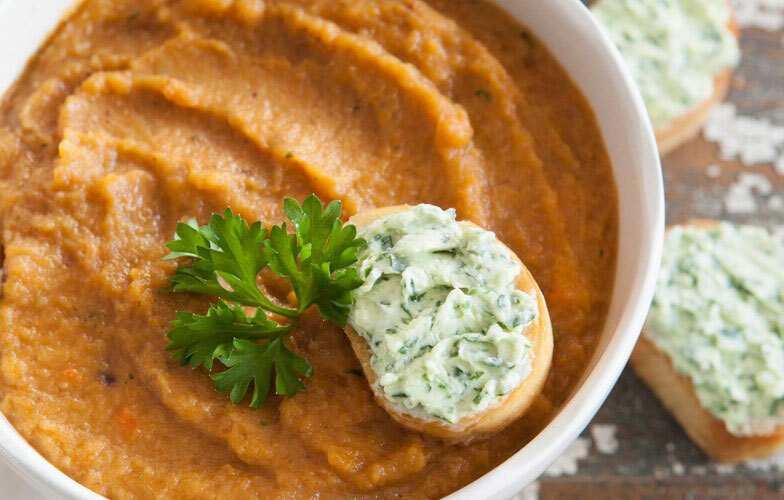 When soup is done, puree with an emersion blender or food processor until smooth, adding more water until desired texture is achieved. Salt to taste.